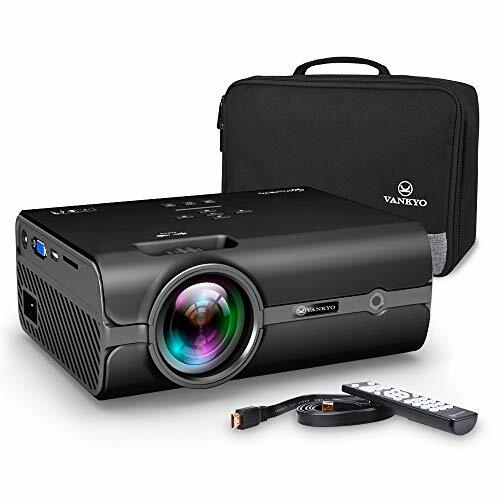 Why Choose VANKYO Portable Professional Video Projector? Three-Year Warranty and 100% Money Back Guarantee, Provide Professional Customer Service and Technical Support. 【IDEAL HOME ENTERTAINMENT】VANKYO Leisure 410 Projector is a Full HD professional portable projector for home entertainment. Brighter than ordinary projectors on the market, especially for movie night, party etc. Note: Use the projector in a dark environment. Not recommend for PPT or office presentation. 【SUPERIOR VISUAL EXPERIENCE】 MStar Advanced Color Engine provides accurate colors and great contrast for images. Supporting 1920x1080 Resolution, 2000:1 Contrast, 33-170 inches Projection Screen, 1.12-6 m Projection Distance, ±15° (vertical) Keystone Correction, Extended lamp life works over 40,000 hours. 【MULTIMEDIA INPUT PROJECTOR】 VANKYO Video Projector support HDIMI port, VGA port, AV port, USB port and SD Card slot and 3.5mm audio jack(headphone/external audio device). Connect varieties of HD devices to easily display your content, such as Amazon Fire TV Stick, smartphone, laptop, PC, DVD, PS3, PS4, X-Box ONE or Wii. 【NOISE SUPPRESSION SYSTEM】 Equipped with powerful cooling system and lower noise due to development and improvement of cooling system design and innovative materials applied. Built-in speaker offers excellent audio support. Easy to set up without the need for costly external speakers. 【SATISFACTION WARRANTY SUPPORT】 Comes with AV, HDMI, VGA, Power Cable, Customized Bag and Remote Control(battery is not included). Three-Year Warranty and 100% Money Back Guarantee, Provide Professional Customer Service and Technical Support. If you have further questions, Please Feel Free to Contact Us!